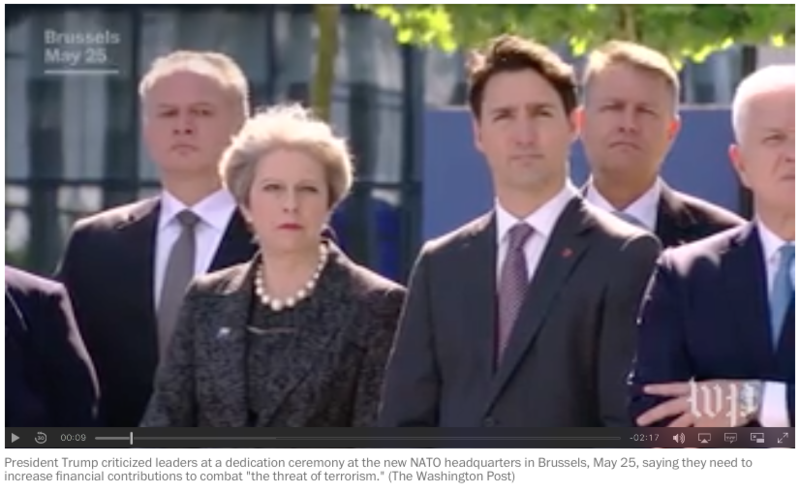 President Trump criticized leaders at a dedication ceremony at the new NATO headquarters in Brussels, May 25, saying they need to increase financial contributions to combat "the threat of terrorism." 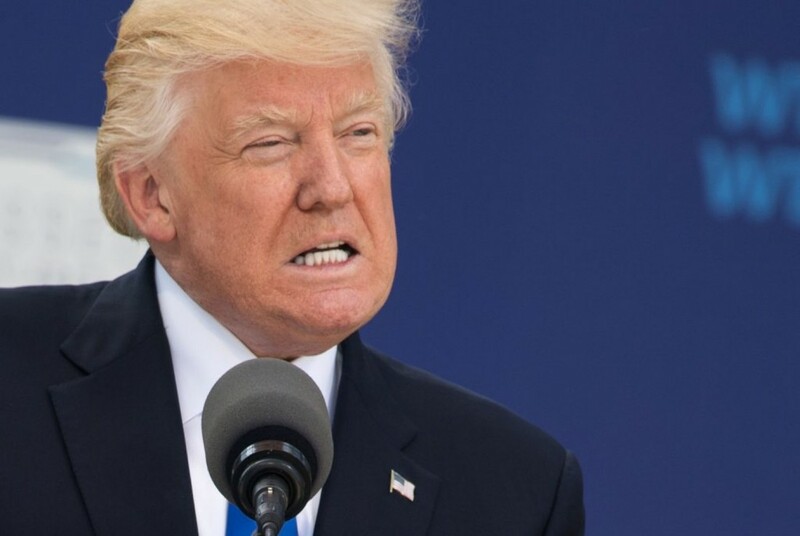 BRUSSELS -- President Trump exported the confrontational, nationalist rhetoric of his campaign across the Atlantic on Thursday, shaming European leaders for not footing more of the bill for their own defenses and lecturing them to stop taking advantage of U.S. taxpayers. Speaking in front of a twisted shard of the World Trade Center at NATO’s gleaming new headquarters in Brussels, Trump upbraided America’s longtime allies for “not paying what they should be paying.” He used a ceremony to dedicate the memorial to NATO’s resolve in the wake of the 2001 terrorist attacks on the United States as a platform from which to exhort leaders to “focus on terrorism and immigration” to ensure their security. And he held back from the one pledge NATO leaders most dearly wanted to hear: an unconditional embrace of NATO’s solemn treaty commitment that an attack on a single alliance nation is an attack on all of them. 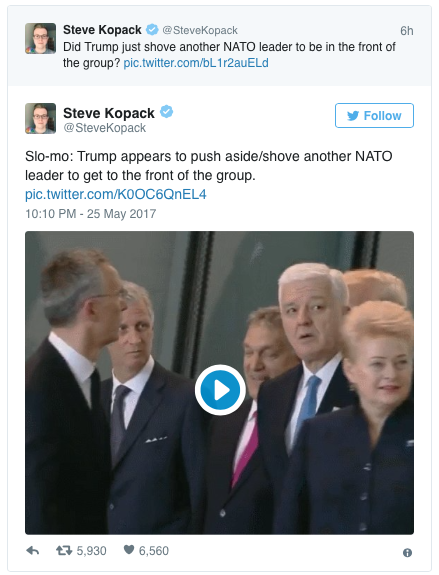 Instead, European leaders gazed unsmilingly at Trump while he said that “23 of the 28 member nations are still not paying what they should be paying and what they are supposed to be paying,” and that they owe “massive amounts” from past years — a misstatement of NATO’s spending targets, which guide nations’ own domestic spending decisions. President Trump and French President Emmanuel Macron shared an intense handshake at their first meeting on May 25. (The Washington Post)The harsh tone had a toll, as Trump was left largely on his own after the speech as leaders mingled and laughed with each other, leaving the U.S. president to stand silently on a stage ahead of a group photo. The long day of gruff Brussels meetings was a contrast from his friendlier Middle East encounters, where Trump embraced the authoritarian Saudi monarchy and said he had been wowed by Saudi King Salman’s wisdom. In Brussels, Trump sat in a morning meeting with top E.U. leaders, where one emerged to say there were deep differences between them about whether the West can work with Russian President Vladimir Putin. The president lunched with French President Emmanuel Macron, where the two leaders shook hands in a tense, white-knuckled embrace. And he sped across Brussels to NATO, where British Prime Minister Theresa May, the leader of Washington’s closest ally, buttonholed him about her anger over intelligence leaks following Monday’s terrorist attack in Manchester. White House press secretary Sean Spicer, traveling with the president, downplayed the absence of Trump’s formal commitment to security guarantees during the speech, saying that there was no question of U.S. support for NATO and all of the obligations that are entailed in membership. “Having to reaffirm something by the very nature of being here and speaking at a ceremony about it is almost laughable,” Spicer said after the speech. Leaders offered modest applause at the end of a speech that he began by asking for a moment of silence in remembrance of the victims of Monday’s terrorist attack in Manchester, England, that killed 22 and wounded many more. The U.S. president started his journey in Saudi Arabia and moved on to Israel and Italy.Trump did not refer to British prime minister’s irritation, expressed earlier in the day, over what officials in England have said was the leak to U.S. news media of intelligence information that Britain gathered in the investigation of the Manchester case and shared with the United States. May talked with Trump about the issue inside the closed meetings, a senior British government official said. Trump is already under fire at home for violating intelligence agreements, following a Washington Post report that he revealed sensitive information on the Islamic State, obtained from Israel, to the Russian foreign minister and ambassador to Washington. In a presidential statement issued while Trump was at the ceremony, he called the Manchester leaks “deeply troubling,” vowed to “get to the bottom” of them and called for a full investigation by U.S. agencies, one that could end with prosecutions, he said. Trump’s speech likely disappointed leaders who had hoped for a public commitment from the U.S. president to NATO’s security guarantees, which he called into question during his presidential campaign last year when he said he would check a country’s defense spending before coming to its aid. Trump’s Cabinet officials have made the direct pledge in recent months, but top officials of other NATO allies said that Trump’s personal guarantee would eliminate any lingering doubts. In the speech, Trump gave no specific commitment to Article 5, the collective security provision that has been invoked only once — following the September 2001 attacks. “Our NATO allies responded swiftly and successfully, invoking for the first time the Article 5 commitment,” Trump recalled. A senior administration official said that no one should “read into” Trump’s remarks any lack of U.S. commitment to the alliance’s collective defense obligations. Trump began his day in Brussels at a meeting with European Union leaders Donald Tusk and Jean-Claude Juncker. “Values and principles first, this is what we — Europe and America — should be saying,” Tusk told reporters. Tusk, who has expressed concern before about the new U.S. administration, said he and Trump agreed on counterterrorism, but did not see eye to eye on a number of other issues, including climate change, trade and Russia. After the E.U. meeting, Trump had a private lunch with Macron at the residence of the U.S. ambassador to Belgium, where he is staying while in Brussels. Trump greeted the new French president at the door with a handshake and a hearty,“ How are you?” as Macron stepped out of his black limousine. France has urged Trump not to pull out of the 2015 Paris climate accord, a decision he has hinted at but that the administration says has not yet been made. On this fourth and penultimate stop on Trump’s nine-day trip, the first overseas travel of his presidency, Trump did not appear to find the near adulation he experienced from Arab leaders in Saudi Arabia, and from the Israeli government in Jerusalem. At those stops, they agreed with Trump’s call to concentrate on counterterrorism and economic growth, with no discussion, at least in public, about human and civil rights concerns that had dogged U.S.-Middle East relationships under President Barack Obama. NATO’s leaders used the excuse of the vast new headquarters to invite the former real estate mogul for a ribbon-cutting, even though construction on the site — a former military airfield — is not yet finished. Beyond its official purpose, however, the meeting was designed to allow Trump and NATO to take the measure of each other. 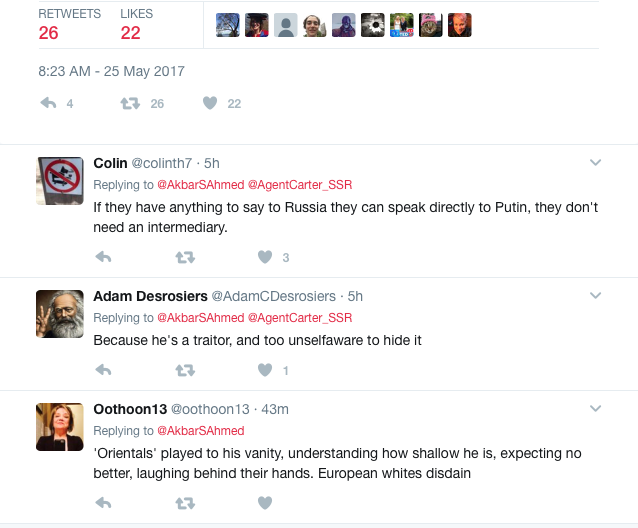 Some allies feel the golden word of the president would finalize the message to Russia and others across the NATO border. It still could come up in their private conversations over dinner. NATO has officially pledged that all members will reach the goal of spending at least 2 percent of their gross domestic product on defense by 2024. Secretary General Jens Stoltenberg noted Thursday morning that overall spending among members has been up for two years in a row, and he said he anticipated that increases would now speed up as the alliance addresses the terrorist threat. He said NATO was ready to join the U.S.-led coalition against the Islamic State — to which all individual members already belong — although he said NATO would not have a combat role on the ground in Iraq and Syria. Among increased contributions to counterterrorism, he said the alliance would step up support of NATO AWACS planes and intelligence-sharing, and provide refueling capabilities. “We will now establish a new intelligence fusion cell at the headquarters addressing terrorism, including foreign fights. “And we will also appoint a special coordinator for NATO’s efforts fighting terrorism,” Stoltenberg said. He called it a “strong political message,” as well as a practical one. Stoltenberg also said NATO would consider increasing its noncombat troop presence in Afghanistan. The administration is currently reviewing its own presence there, including adding up to 5,000 troops to the nearly 10,000 already on the ground and expanding their role assisting Afghan government forces fighting both the Taliban and a local Islamic State presence. Karen DeYoung is associate editor and senior national security correspondent for the Washington Post. Michael Birnbaum is The Post’s Brussels bureau chief. He previously served as the bureau chief in Moscow and in Berlin, and was an education reporter. After Trump called NATO obsolete (then proceeded to walk that back), Europe was looking for public support of Article 5, which affirms that NATO members will come to the mutual defense of any member that is under attack. But alas, Trump could not even bring himself to utter explicitly that the U.S. supports Article 5 in his remarks at Brussels, which every single U.S. president has done since Harry Truman in 1949. If NATO allies were nervous about the United States’ commitment to Europe’s security before, they must be fuming now. The NATO summit comes as reports surface that British police are withholding intelligencefrom the United States after leaks to U.S. media about the Manchester bombing investigation, and weeks after Trump revealed highly classified information to the Russians about operations against the Islamic State. 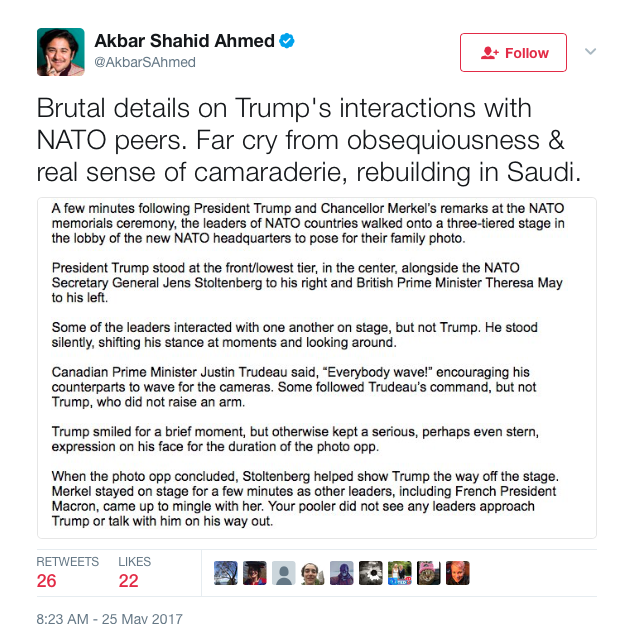 For all of Trump’s fire and fury about the United States getting the raw end of the deal from NATO, from an optics standpoint, it is the United States that is looking like the irresponsible partner.